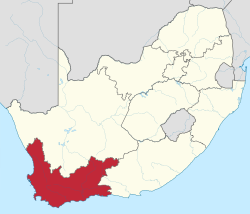 Western Cape is one of South Africa's nine provinces. It surrounds the Cape of Good Hope. The majority of the people live in the metropolitan area of Cape Town, which is also the capital. ↑ Mid-year population estimates, 2018 (PDF) (Report). Statistics South Africa. 31 July 2018. p. 2. Retrieved 29 July 2018. This page was last changed on 28 January 2019, at 21:49.